In phonetics, a vowel is a sound in spoken language, with two competing definitions. In the more common phonetic definition, a vowel is a sound pronounced with an open vocal tract, so that the tongue does not touch the lips, teeth, or roof of the mouth, such as the English "ah" /ɑː/ or "oh" /oʊ/. There is no build-up of air pressure at any point above the glottis. This contrasts with consonants, such as the English "sh" [ʃː], which have a constriction or closure at some point along the vocal tract. 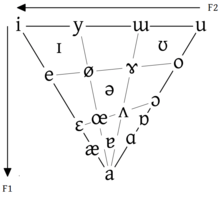 In the other, phonological definition, a vowel is defined as syllabic, the sound that forms the peak of a syllable. A phonetically equivalent but non-syllabic sound is a semivowel. 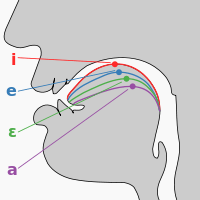 In oral languages, phonetic vowels normally form the peak (nucleus) of many to all syllables, whereas consonants form the onset and (in languages that have them) coda. Some languages allow other sounds to form the nucleus of a syllable, such as the syllabic (i.e., vocalic) l in the English word table [ˈtʰeɪb.l̩] (when not considered to have a weak vowel sound: [ˈtʰeɪb.əl]) or the syllabic r in Serbo-Croatian word vrt [vr̩t] "garden". The phonetic definition of "vowel" (a sound produced with no constriction in the vocal tract) does not always match the phonological definition (a sound that forms the peak of a syllable). The approximants [j] and [w] illustrate this: both are produced without much of a constriction in the vocal tract (so phonetically they seem to be vowel-like), but they occur at the onset of syllables (e.g. in "yet" and "wet") (which suggests that phonologically they are consonants). A similar debate arises over whether a word like bird in a rhotic dialect has an r-colored vowel /ɝ/ or a syllabic consonant /ɹ̩/. The American linguist Kenneth Pike (1943) suggested the terms "vocoid" for a phonetic vowel and "vowel" for a phonological vowel, so using this terminology, [j] and [w] are classified as vocoids but not vowels. However, Maddieson and Emmory (1985) demonstrated from a range of languages that semivowels are produced with a narrower constriction of the vocal tract than vowels, and so may be considered consonants on that basis. Nonetheless, the phonetic and phonemic definitions would still conflict for the syllabic el in table, or the syllabic nasals in button and rhythm. 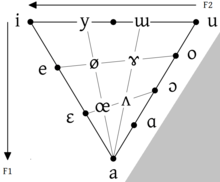 The original vowel quadrilateral, from Jones' articulation. The vowel trapezoid of the modern IPA, and at the top of this article, is a simplified rendition of this diagram. The bullets are the cardinal vowel points. (A parallel diagram covers the front and central rounded and back unrounded vowels.) 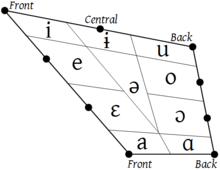 The cells indicate the ranges of articulation that could reasonably be transcribed with those cardinal vowel letters, [i, e, ɛ, a, ɑ, ɔ, o, u, ɨ], and non-cardinal [ə]. If a language distinguishes fewer than these vowel qualities, [e, ɛ] could be merged to [e], [o, ɔ] to [o], [a, ɑ] to [a], etc. If a language distinguishes more, [j] could be added where the ranges of [i, e, ɨ, ə] intersect, [ʊ] where [u, o, ɨ, ə] intersect, and [ɐ] where [ɛ, ɔ, a, ɑ, ə] intersect. The letters [e, ø, ɤ, o] are typically used for either close-mid or true-mid vowels. However, if more precision is required, true-mid vowels may be written with a lowering diacritic [e̞, ø̞, ɤ̞, o̞]. The Kensiu language, spoken in Malaysia and Thailand, is highly unusual in that it contrasts true-mid with close-mid and open-mid vowels without differences in other parameters such as backness or roundness. Although English contrasts six heights in its vowels, they are interdependent with differences in backness, and many are parts of diphthongs. It appears that some varieties of German have five contrasting vowel heights independently of length or other parameters. The Bavarian dialect of Amstetten has thirteen long vowels, reported to distinguish five heights (close, close-mid, mid, open-mid and open) each among the front unrounded, front rounded, and back rounded vowels, plus an open central vowel, thus five vowel heights on the whole: /i e ɛ̝ ɛ/, /y ø œ̝ œ/, /u o ɔ̝ ɔ/, /ä/. Otherwise, languages are not known to contrast more than four degrees of vowel height. The parameter of vowel height appears to be the primary cross-linguistic feature of vowels in that all spoken languages use height as a contrastive feature. No other parameter, even backness or rounding (see below), is used in all languages. Some languages have vertical vowel systems in which at least at a phonemic level, only height is used to distinguish vowels. To them may be added front-central and back-central, corresponding to the vertical lines separating central from front and back vowel spaces in several IPA diagrams. Different kinds of labialization are possible. 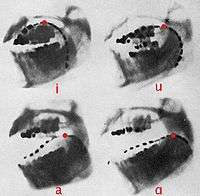 In mid to high rounded back vowels the lips are generally protruded ("pursed") outward, a phenomenon known as exolabial rounding because the insides of the lips are visible, whereas in mid to high rounded front vowels the lips are generally "compressed" with the margins of the lips pulled in and drawn towards each other, a phenomenon known as endolabial rounding. However, not all languages follow that pattern. Japanese /u/, for example, is an endolabial (compressed) back vowel, and sounds quite different from an English exolabial /u/. Swedish and Norwegian are the only two known languages in which the feature is contrastive; they have both endo- and exo-labial close front vowels and close central vowels, respectively. In many phonetic treatments, both are considered types of rounding, but some phoneticians do not believe that these are subsets of a single phenomenon and posit instead three independent features of rounded (exolabial), compressed (endolabial) and spread (unrounded). Others distinguish compressed rounded vowels, in which the corners of the mouth are drawn together, from compressed unrounded vowels, in which the lips are compressed but the corners remain apart as in spread vowels. The rarest vowels cataloged are /ɜ/ (has just been cataloged in Paicî and a few dialects of English, such as Received Pronunciation and Great Lakes) and /ʊ̈/ (Early Modern English and Russian). So far, all of these syllabic consonants, at least in the lexical words, have been sonorants, such as [r], [l], [m], and [n], which have a voiced quality similar to vowels. (They can carry tone, for example.) However, there are languages with lexical words that not only contain no vowels, but contain no sonorants at all, like (non-lexical) shh! in English. These include some Berber languages and some languages of the American Pacific Northwest, such as Nuxalk. An example from the latter is scs "seal fat" (pronounced [sxs], as spelled), and a longer one is clhp'xwlhtlhplhhskwts' (pronounced [xɬpʼχʷɬtʰɬpʰɬːskʷʰt͡sʼ]) "he had had in his possession a bunchberry plant". (Follow the Nuxalk link for other examples.) Berber examples include /tkkststt/ "you took it off" and /tfktstt/ "you gave it". Some words may contain one or two consonants only: /a/ "be", /ks/ "feed on". (In Mandarin Chinese, words and syllables such as sī and zhī are sometimes described as being syllabic fricatives and affricates phonemically, /ś/ and /tʂ́/, but these do have a voiced segment that carries the tone.) In the Japonic language Miyako, there are words with no voiced sounds, such as ss 'dust', kss 'breast/milk', pss 'day', ff 'a comb', kff 'to make', fks 'to build', ksks 'month', sks 'to cut', psks 'to pull'. ↑ "Vowel". Online Etymology dictionary. Retrieved 12 April 2012. ↑ Ladefoged, Peter; Maddieson, Ian (1996). The Sounds of the World's Languages. Oxford: Blackwell. p. 323. ISBN 0-631-19814-8. ↑ Deterding, David (1997). "The formants of monophthong vowels in Standard Southern British English Pronunciation". Journal of the International Phonetic Association. 27: 47–55. doi:10.1017/S0025100300005417. ↑ Hawkins, Sarah and Jonathan Midgley (2005). "Formant frequencies of RP monophthongs in four age groups of speakers". Journal of the International Phonetic Association. 35 (2): 183–199. doi:10.1017/S0025100305002124. ↑ Flemming, Edward and Stephanie Johnson (2007). "Rosa's roses: reduced vowels in American English". Journal of the International Phonetic Association. 37: 83–96. doi:10.1017/S0025100306002817. ↑ Deterding, David (2003). "An instrumental study of the monophthong vowels of Singapore English". English World-Wide. 24: 1–16. doi:10.1075/eww.24.1.02det. ↑ Salbrina, Sharbawi (2006). "The vowels of Brunei English: an acoustic investigation". English World-Wide. 27 (3): 247–264. doi:10.1075/eww.27.3.03sha. ↑ Bohn, Ocke-Schwen (2004). "How to organize a fairly large vowel inventory: the vowels of Fering (North Frisian)" (PDF). Journal of the International Phonetic Association. 34 (2): 161–173. doi:10.1017/S002510030400180X. ↑ Gordon, Matthew and Ayla Applebaum (2006). "Phonetic structures of Turkish Kabardian". Journal of the International Phonetic Association. 36 (2): 159–186. doi:10.1017/S0025100306002532.